Many people believe that all trampolines are generally all the same. They just bounce up and down, right? Though they do look similar to the untrained eye, trampolines come in many different shapes and sizes, and are built for specific purposes. Comparing a backyard trampoline with a trampoline at your local trampoline club will reveal great differences in both style and quality. Yes, their essential purpose is the same --- to provide a jumping surface --- but the difference in size, shape and amount of bounce is quite significant. Some trampolines are designed specifically for recreation – fun, fitness, stress relief – while other trampolines are used for professional sporting purposes. New trampoline uses are constantly being invented and current uses continue to evolve to meet ever-changing needs. Trampolinists must keep their intended purpose in mind when buying a trampoline. Read on to learn more about the many trampoline options that are available! 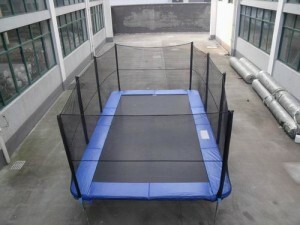 One of the smallest trampolines around is the rebounder or mini-trampoline. These small, compact trampolines are designed to be used indoors by a single person and are intended to help elevate the heart-rate through vigorous movements, as often seen in exercise videos. They are small enough to be hidden-away in a closet or under a bed when not in use, making them a perfect choice for people living in a small home or apartment. A low-impact bounce that helps to alleviate the stress on the feet and legs usually associated with high-impact activities like running. Improved balance, coordination and blood circulation. It's great for those who experience joint pain, poor muscle tone or poor circulation. A form of cellular exercise, involving all voluntary and involuntary muscles. The opportunity to add stabiliser bars, which assist in retaining balance. An inexpensive addition to any workout program! Olympic trampolines (or professional trampolines) are in a league of their own and can't be compared to any other trampoline model. These large trampolines are specifically designed to provide athletes with maximum performance with immense amounts of power and propulsion. Many professional trampolines are especially designed for the Olympic Games and gymnastics clubs, and are therefore the most expensive, costing over $10,000. Due to their increased power and performance, these devices are recommended for trained individuals only. Olympic trampoline jump mats are manufactured to be like netting and are much more porous than the average backyard trampoline jump-mat, providing greater reactions to force. Due to the height that can be gained from these trampolines, the safety-padding around the edges of the frame is significantly thicker than that of recreational trampolines. All gyms also position padding surrounding the trampoline frame and ensure they are used under careful supervision. Size! At a standard size of 14ft x 7ft, professional trampolines are usually too large and costly for a backyard – budding trampolinists who wish to attempt advanced trampoline tricks and manoeuvres will benefit from a professional device under professional supervision and a local gymnastics club! Recreational backyard trampolines have been a classic in childhood memories since the day they were invented, but new technological advancements have made them safer, more enjoyable and more widely available than ever before. These trampolines are affordable and space-efficient, making them a perfect recreational tool for all families! As a popular feature of many backyards, there is a huge range of trampoline models available. The quality of recreational backyard trampolines can differ greatly between manufacturers, so it's important to always investigate the general design and materials used in each product and brand. 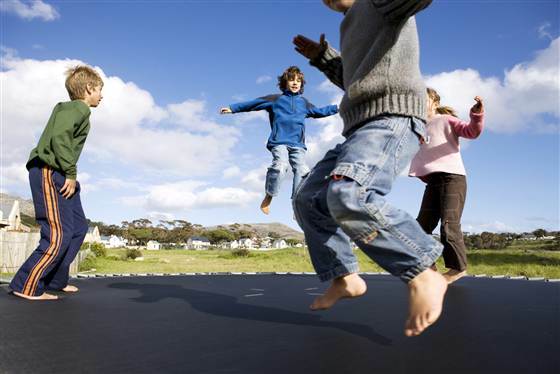 Trampolines are an investment that can be enjoyed for many years, so choose carefully! Vuly leads the way in providing quality trampolines at competitive prices. We use the highest-quality materials to give your family the best and safest result. Our superior design is immediately apparent upon inspection and we pride ourselves on having the safest and most durable recreational trampoline models in the industry. Primarily used by trained gymnasts and expert trampolinists. Earlier backyard trampoline models only came in a rectangular shape. This shape is the most powerful because more springs act in the same direction, giving the user a greater rebound with increased height. Made of thick steel to withstand the impact of the rebound. While the steel creates a sturdy, solid structure, it also makes the rectangular trampolines heavy and difficult to move around, which can be impractical for most families. More expensive than other models. On average, rectangular trampolines cost twice as much as leading circular trampoline models. Able to fit nicely in a corner of your backyard, or off to one side. Their orderly appearance is very appealing and effortlessly complements the rectangular shape of most backyards. Prone to uneven frame wear because the force of impact tends to be directed to specific points along the frame. You have to carefully calculate a landing in order to avoid injury or frame damage. If a user's weight is not evenly distributed across the entire jump mat, they will experience an unexpected rebound that may cause injury. This risk is increased as the user moves closer to an edge or corner. All jumpers using a rectangular trampoline need to be carefully supervised at all times. 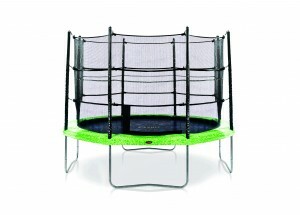 Growing in popularity, and are now the most common trampoline shape in the industry today. Highly recommended for users of all ages and they are among the safest trampolines on the market. Innovative safety accessories and design improvements are constantly developing for use in round trampolines. Highly economical because they require less steel for the frame. The entire frame absorbs the forces applied to it each time a person jumps. The decreased amount of weight that is needed to create a sturdy frame results in a less expensive, safer device for your family. The lightweight round shape is also much less expensive to ship than other conventional trampoline models. Usually light enough to be transported and assembled by one person, easily moved around the backyard or disassembled. Fantastic for the even distribution of force on the trampoline. The circular nature of these trampolines causes each of the springs around the entire circumference to evenly stretch, rather than the uneven force distribution that occurs with rectangular trampolines. Effective in providing a rebound response throughout the centre of the jump-mat. The trampoline tends to push the user back towards the centre if they start to get close to the edges. Deciding on the right trampoline model takes considerable thought. When choosing a backyard trampoline for your family, it is important to consider what shape will best suit the user's needs, so don't forget to consider age, weight and skill level. Please contact our friendly sales staff at Vuly if you have any further questions or more info on Vuly's innovative safety features, safety tips and expert advice!